Berkeley, CA â€“ 16 January 2011 - Brandon Graham and Simon Roy’s brilliant re-imagining of Rob Liefeld’s PROPHET doesn’t hit stores until Wednesday, but it’s already sold out at the distribution level today. Image has announced a second printing of PROPHET #21 is being rushed to press as back orders for the first issue of the Extreme relaunch continue to grow. Kicking off an all-new era for Rob Liefeld’s Extreme titles, PROPHET #21 opens with John Prophet awakening from cryosleep in the distant future on an Earth that has been inhabited by alien settlers. His mission is simple: Re-start the human empire. 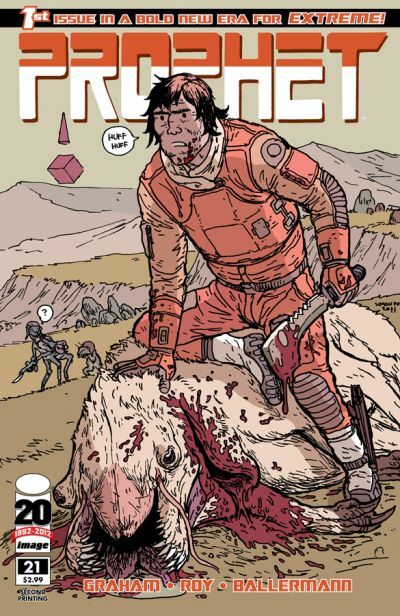 Critically acclaimed KING CITY creator Brandon Graham heads up the visionary new creative team on PROPHET, with up and coming artist Simon Roy (JAN’S ATOMIC HEART) providing the breathtaking visuals. The first issue features a painted cover by Russ Manning Award winner Marian Churchland (BEAST, ELEPHANTMEN), plus a variant cover by Rob Liefeld. The second printing cover will feature an all-new image by Roy. “This is one of those situations where I hate to say something as glib as ‘We told you so,’ but in the nicest way possible: We did,” said Image Comics Publisher Eric Stephenson. “There’s been review after glowing review, along with rousing endorsements from the likes of Warren Ellis â€“ it’s not a secret Brandon and Simon have turned in a brilliant first issue. It’s always nice to be able to say orders on a book have continued to climb post-FOC, but personally, I think it’s better to actually have books on the stands. PROPHET #21 (NOV110358), a 32-page full-color comic book for $2.99, is on sale in stores and digital platforms this Wednesday, January 18, while supplies last. The second printing of PROPHET #21 (NOV118136) is now available for reorder and will be back in stores the week before PROPHET #22 (DEC110566) hits on February 15.